» 1/22 Living Local — The Best Freebie in Las Vegas! Things are beginning to heat up again in Laughlin, Nevada. And we’re not talking about the Colorado River community’s weather, where the average summer temperatures range between 106 and 110 degrees. The area’s gaming market is starting to sizzle, as well. Since 2014, Laughlin casinos have steadily increased gaming revenue. The market has an outside chance of eclipsing last year’s 4.1 percent increase of $492.8 million. Through November, gaming revenue is up 3.2 percent, to $476.5 million, according to the Nevada Gaming Control Board. With the injection of new casino ownership, Laughlin’s future continues to shine. Union Gaming Group analyst John DeCree said recently that Laughlin is becoming increasingly relevant for the investment community. Caesars Entertainment, Eldorado Resorts and Golden Entertainment all now hold significant pieces of the gaming town, located roughly 95 miles south of Las Vegas. 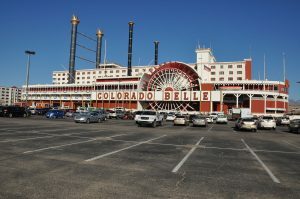 No company has a bigger stake than Las Vegas-based Golden Entertainment, which recently bought the Colorado Belle and Edgewater casinos from Marnell Entertainment for $190 million. Coupled with its ownership of the Aquarius resort, which came aboard in 2017 through the company’s $850 million purchase of American Casino & Resort Properties, Golden controls roughly 42 percent of Laughlin’s approximately 9,800 hotel rooms and 35 percent of its gaming supply of roughly 7,500 slot machines and 212 table games. Laughlin has 10 commercial casinos in the market – 11 when you count the tribal-owned Avi Casino Resort, roughly 22 miles from the heart of the Laughlin casino Strip. Reno-based Eldorado has been in the market since last fall after acquiring the operations of Tropicana Laughlin through the joint $1.8 billion acquisition of Tropicana Entertainment with Gaming and Leisure Properties. Caesars has been in the market since the early 1990s, when its predecessor Harrah’s Entertainment opened the Harrah’s Del Rio. The venue has since been rebranded as Harrah’s Laughlin. Tilman Fertitta’s privately-held Landry’s has owned the Golden Nugget Laughlin since 2006. DeCree said it would likely be hard for other public companies to enter the market. “There isn’t much left to buy,” he said, adding that the only large property that could come available is the Riverside, which is owned by 87-year-old town founder Don Laughlin. It’s doubtful Caesars would part with Harrah’s Laughlin, he added. Real estate investment trust VICI Properties has a “call option” on the property’s real estate. “That would be the most probable exit for Caesars, though the asset generates quite a bit of cash flow, I think they would stay involved as operator,” DeCree said. Golden Entertainment has an opportunity to better control pricing in the market, DeCree said. The company’s three resorts cover 55 contiguous acres along the heart of the Laughlin Riverwalk and include the 11,000-seat Laughlin Events Center. “The promotional fight in Laughlin is typically on (average daily room rate) and Aquarius has done an excellent job of holding firm on room pricing, resulting in considerable margin expansion,” DeCree said, noting in his report that room rates have increased 3 percent annually since 2013. “The discussion on Golden has been overly focused on Stratosphere, and while the renovations in Las Vegas are coming along, we believe Laughlin should be a bigger focus for investors given its relative contribution and growth outlook,” DeCree said. According to the Las Vegas Convention and Visitors Authority, tourism to Laughlin has declined considerably since 2002, when the market drew more than 4 million visitors. Roughly 1.9 million people visited Laughlin in 2017, and the market is down 2 percent through the first 11 months of 2018. DeCree said many Laughlin operators blame the expansion of Native American gaming in Arizona and Southern California – the key feeder markets. Phoenix is a three-and-a-half-hour drive from the east and the Los Angeles area is just four-and-a-half-hours to the west. Bullhead City, Arizona, located just across the Colorado River from Laughlin, operates a small airport that brings in some commercial flights from various parts of the country, but the service has diminished over the years. DeCree said several of the casinos use the airport for charter air service. Laughlin’s non-gaming revenue has increased somewhat, now accounting for 35 percent of the overall total. This leaves room, DeCree says, for considerable growth in both lodging and food and beverage spending. Laughlin is also seasonal; the first half of the year often sees the market’s strongest months. Snowbirds and retirees will spend up to two months in the community. The now Golden-controlled Laughlin Events Center is one of the key non-gaming visitation drivers for the community, with most of the properties contributing marketing dollars to attract big-name country music acts, including Tim McGraw, Brad Paisley, and Zac Brown. DeCree said a major event at the center could drive a citywide sellout and increase Laughlin’s average daily room rate. “With deeper pocket public companies coming into the market, there might be an opportunity to attract more frequent headliners that could drive incremental demand,” he said.